Knight News filed a lawsuit Wednesday afternoon to obtain records that appear to have been covered up by the University of Central Florida. Audio of an important meeting where Colbourn Hall was discussed is one of the records sought in the lawsuit. Portions of the audio that should have been originally recorded somehow disappeared — or the recording was abruptly cut off — at the key moment where trustees discussed building Trevor Colbourn Hall. UCF’s failure to respond to public records requests in good faith left the public in the dark about how the critical part of the recording could have gone missing, according to the suit. Knight News made a public records request for records related to the Colbourn Hall controversy on September 25, 2018. A UCF spokesman claimed no records were responsive to the request, however, some of the documents appeared to be in the Bryan Cave investigative report released last week. The outside investigation was launched by UCF in order to find out how the university could have misspent funds intended for research and maintenance, according to the Board of Trustees. BREAKING: Knight News filed a lawsuit asking a judge to hold UCF accountable for its lack of transparency in the #ColbournHallControversy. The man in the spotlight of the investigation, former UCF CFO Bill Merck, and his attorney alleged that UCF concealed emails that would have implicated others within the administration – emails the attorney received privately, anyway, asserting further that UCF went to lengths to conceal the records. When Colbourn Hall records were requested by the Orlando Sentinel for coverage, UCF stated that since they had a part in a Florida House investigation, they could not be released. UCF never made that assertion to Knight News, however, UCF did delay the release of other records Knight News requested until Knight News put UCF on notice of a potential suit. Those records show that UCF Vice President and General Counsel Scott Cole, UCF Vice President Grant Heston — both of whom directly report to UCF President Whittaker — were involved in responding to Bryan Cave’s request to define the scope of the investigation. UCF has refused to directly answer questions about whether the investigation should have been directed by a special committee, comprised of trustees that had no involvement at all in the original approvals Trevor Colbourn Hall. Records show the scope was largely defined by a script BOT Chair Marchena prepared prior to a BOT meeting, although Heston mentioned Marchena did change some language from the script. Knight News lawyer Justin Hemlepp reacted, in general, to UCF’s lack of transparency. “I am disgusted by UCF’s behavior. 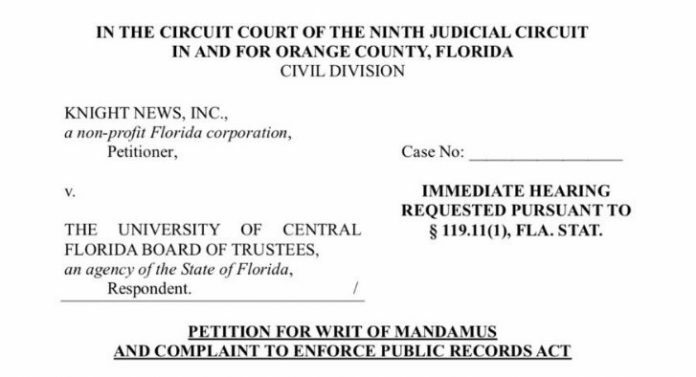 Knight News has filed, before this, three different lawsuits that have done nothing to deter the university from violating Florida’s open government laws. Somehow instead of being deterred, UCF has been emboldened and begun losing records,” Knight News lawyer Justin Hemlepp said, referring to the mysterious missing audio and failure to produce records. Knight News will bring the lawsuit to the courts to enforce the Public Records Act and ultimately find out if UCF broke the law again. “UCF’s outside investigation and President Whittaker expressed concern about the ‘culture’ at UCF concerning oversight. My client has been raising this issue for years now. And now UCF’s chickens are coming home to roost. UCF’s behavior is indicative of what President Whittaker calls a ‘broken culture” which extends far beyond the complicated and boring financing of construction public buildings to withholding public records about that construction,” Hemlepp said. The lawsuit was assigned to the Honorable Orange County Circuit Judge Lisa T. Munyon, court records show. Check back for updates. Support Knight News, Inc. and student journalism by making a tax deductible donation. Find information on how you can donate, here.